I had a long ride to an event organized by Lakeshore Arts and Neighborhood Arts Network where I got to meet and talk to a insightful industry experts about the business of art. Part of my ride to the event involved 30 minutes in the subway and 45 minutes in the street car : perfect time to sketch. On the subway, most of the passengers were most likely going home from a long day of work. There was a lot of tired people, including this tired man who was catching on some sleep. 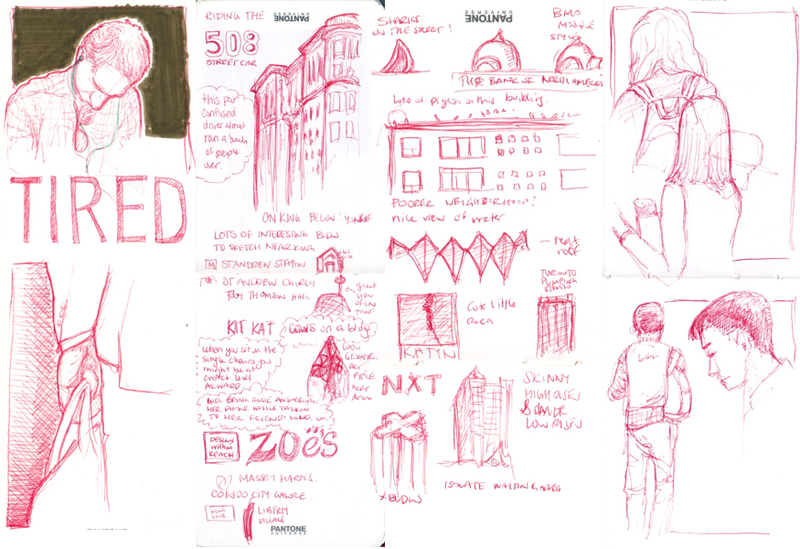 In the streetcar, I sketched some of the things I saw on King Street while riding the 508. I could mostly sketch things while we were stopped at a red light, trying to catch interesting "landmarks"that could potentially be a great meeting place for the sketching group in the near future. The Roy Thompson Hall is a great candidate. There are a lot on interesting buildings and sculptures along the way. It's also interesting to see the changes in the feel of the areas as we move from one neighbourhood to another.